Sometimes everything just works out. You get good weather, manage not to screw up the approach and have a perfect day. This weekend the stars aligned, so to speak, and a great day was had climbing Mount Conness. Typical to any outing, I did my research, read up about the Harding Route as much as possible and shot emails to friends who might know about the route. A recent thread provided a bunch of information and on Friday we were off. A bunch of traffic put us at Tioga pass after 10 pm, taking more than 7 hours from San Diego. Psyched that we are not lost and that it is light outside. A long approach prompted a 4:30 am wake-up and we hoped our timing would land us at the cross country travel section just after the sun rose. I gulped down some NyQuil to reduce the effects of a cold I was fighting and passed out. The dark morning came too soon and after applying sunscreen in the dark, ( a new favorite activity) eating some food and repacking we were on our way. We re-parked the car near the Sawmill Campground on the side of the road, hoping the lack of No Parking signs was adequate permission. Finally we were on the trail by 5:30 am. The start of the approach is on big trails before we had to cut off across more rugged terrain. Since the approach seems a bit confusing I made an earlier post with photos showing how we hiked in. In no time we had passed the Carnegie Institute and were trying to figure out when to leave the trail. 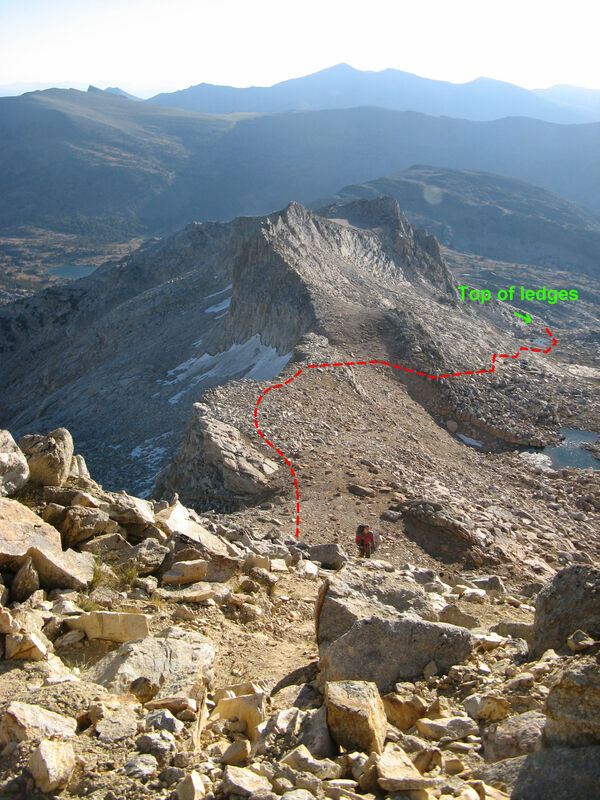 An alternate approach, shown in the Supertopo for the North Ridge, requires a few more miles of hiking but goes past the Conness Lakes seen in the photo above. It seems that if time was not an issue this approach would be very pretty alternative. Goofing around as the sun rises. At the end of the steep switchbacks, that I am hiking up in the photo below, we took a break to catch our breath in the thin air. We were in no rush and I was trying to be careful with my exertion due to being sick. All of a sudden two more climbers came up the trail, who we hadn’t seen, and passed us on their way to the South West face. Our attitudes dropped a little since we wouldn’t be first on the route but we took it in stride and relaxed even longer to give them some space. A little while later we were on our own again since we had to stop and rack up for the decent. Meanwhile the other party, who had slept near by and already had their harness on, continued down to find the descent gully. The wind was howling across the plateau below the summit so we both decided to bring an extra warm layer on the climb. In an attempt to stay light and fast we decided against a back pack and stuffed food in our pockets. With a liter of water on each of our harnesses Robb and I switched into our light weight shoes. Robb in his Deascents and I in my Sanuks made our way to the base of the route via a steep but reasonable gully. We looked for the other party but they were no where in sight and I assumed they were hidden by some rock feature. The first few pitches, as we climbed them, on the Harding route of Mt Conness. Leading up the first pitch. Luckily it was not too wet. Despite wicked cold on the first part of the descent the route was warm and we quickly peeled off fleeces and tied them to our waists. We both cursed our over preparation since added weight = less speed. Robb, giving me his shoes, fleece and jacket now took over the lead for the crux offwidth pitch. This was the physical crux of the route even though it was graded lower than the second pitch. Robb made good progress figuring out a tricky stem that allowed him past the first 7″ crack. Our #6 C4 was very useful for this section and Robb also clipped the many ancient star drive bolts that Warren Harding had placed on the First Ascent. You can check out the crazy ring pin hangers in the photo below. A psyched Robb after sending the famous offwidth pitch. After we had both sent the offwidth Robb had another exciting lead with a tenuous face traverse and a steep section of climbing before entering the final chimney. I was happy not to have a pack when I followed this pitch and even put all of my jackets on since the wind had picked up. At the top of this long pitch we switched leads and I led the last 5.9 pitch. With Robb’s long chimney lead, which linked two pitches, we had finally speed up a little and were distancing our selves from the other party who had been making good time. My favorite photo from the weekend which captures a bit of the alpine splendor. I really enjoyed what was our 5th pitch, photo above, with many crazy flared cracks that demanded balance and good footwork. The wind really started blowing as I got higher on the pitch and communication was impossible. Finally I reached the 3rd class ramp listed on the topo and set up a very exposed belay, constantly buffed by wind. Thankfully Robb followed super fast as I struggled to pull up the rope at the same pace. Robb moved the belay to the top of the 3rd class ramp to escape the wind a bit more and I climbed the final corner to the super easy summit ridge. I likely could have belayed higher on the ramp but couldn’t hear Robb to know how much rope was left. We un-roped on the easy terrain at the top and made our way to the summit. Moving quickly over the low angle rock, we could both feel the elevation, a first for the day. Amazingly two other teams showed up at the 12,500 foot summit at the same time for a little party. A couple had just done the West ridge and a soloist had climbed the North Ridge. Congratulations were exchanged all around, at a summit photo was taken and we signed the register. 3:30pm was the current time and we had been on route for about 6 hours. A quick decent down the summit ridge put us at our packs and in no time we were descending back to the car. Robb at the Carnegie Institute realizing we were going to make it sub 12 hours C2C. Somewhere along the hike down Robb got really excited when he noticed that it had been less than 11 hours since we left the car. A bit of calculation later and we placed bets for total Car to Car time. We managed not to get lost on the cross country decent and hit the main trail around 4:20pm which put us back at the car just before 5pm for an amazing 11:35 hour time. Despite being slow on the first three pitches we did a good job using as much of the 70 meter rope as possible and did the route in 6.5 pitches which includes a half pitch for moving the belay up the 3rd class ramp. We likely could have simuled the last 2.5 pitches but Robb was moving so fast as a second that we might not have gained much time. Overall an amazing day and a super classic route! Getting ready for Pratt’s Crack! Way too many cams since the crack grows larger than a #6. Having three #6 C4’s was pretty novel but way overkill. A single #5 and #6 along with some finger sized cams and a bunch of slings is all you really need, as I noted on MP.com. The crack starts out #6 size but eventually gets too big and you must depend on your technique, the occasional chock stone, and a few small pieces in the back wall. I learned a bunch of squeeze chimney techniques and my TC Pros really worked well for the many heel toe jams that were required. Gear, what gear… I’m going up! The main reason Pratt’s Crack clocks in at 5.9 is the many face hold and occational hands free rest. It was a such a fun climb that I decided to do it again. After getting to the top I pulled up a second rope and rapped cleaning the gear. This gave Robb a chance to lead it, which he did in great style and with a reduced rack thanks to my experience. Are we excited for the wide? I seconded Robb’s lead, so I could practice my chimney technique, and then we moved around the corner to the classic Sheila. While this climb may look a bit awkward it was super fun and had a very long, and awesome, section of #2 camalots in a corner. These bomber hands were so good that Robb just kept running it out and ended up with a single set of .5 camalot and above on his harness when he reached the anchor. Both layback cruxes were protected by little gear and he placed five cams green alien sized and smaller. Robb at the first crux on the hyper classic Sheila. Sheila was a great way to finish off the weekend and we were happy with all of the awesome climbing and near perfect weather. It had been a bit windy the day before but Pine Creek was amazing in the shade with a nice cooling breeze. Hopefully I’ll return to Conness for the West and North ridges but it was great to tick off the Harding route. 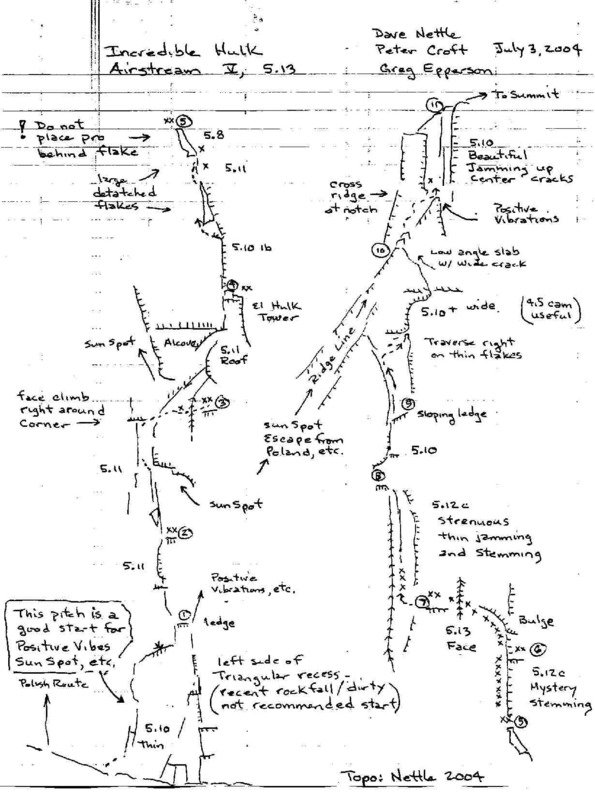 This trip also tempted me to start planning a trip up Keeler Needle to climb yet another classic Harding route. Some day! 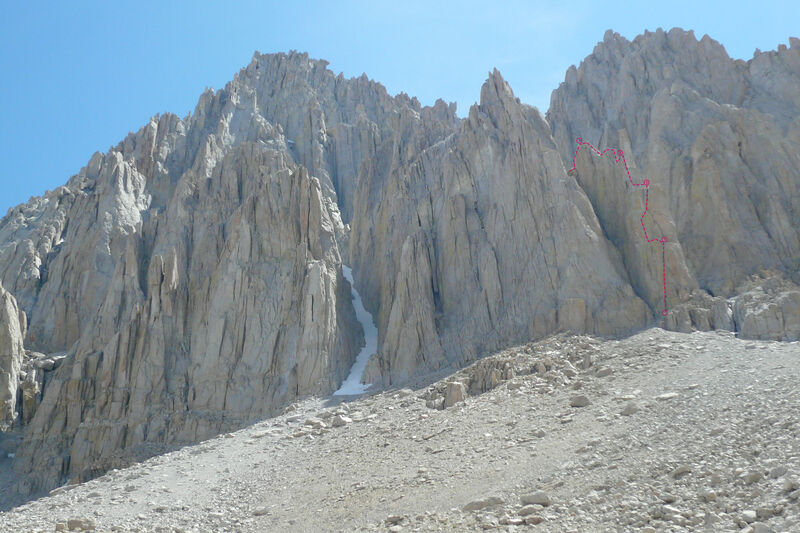 It seems that the approach for Mt Conness can be a bit confusing so here are some photos with the route we took on our way to climb the Harding Route on the Southwest Face. This is the more direct of the two approaches from Saddlebag Lake and supposedly is about 4.5 miles long with 2,500 feet of elevation gain. It took us around 3.5 hours a moderate pace with a few rests. It took another 30 minutes to descend from the summit plateau to the base of the route. On our way back it took less than two hours from the true summit to the car. 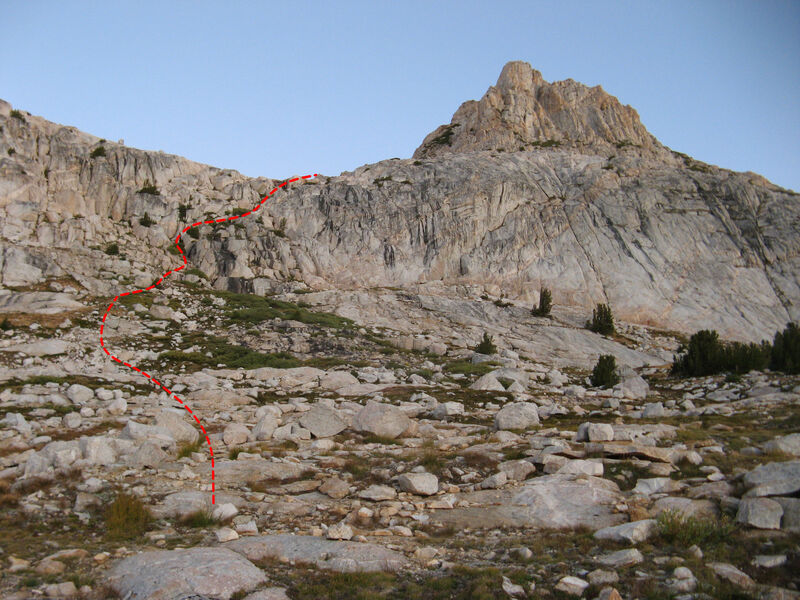 This approach starts at the Sawmill Campground (near Saddlebag Lake) and I believe is the shortest distance to the top of Conness. From the parking lot hike out the good trail/road through the campground passing sites for a while. At some point the trail will narrow a little but stays quite good all the way to the Carnegie Institute. Looking up hill where we left the trail. About 15 to 20 minutes past the Carnegie Wooden Shed we left the trail and started the cross country travel. There were a bunch of cairns on the right side of the trail marking the general area you leave the trail. The basic idea is to head up hill taking the easiest path towards the peak seen in the photo above and below. A bit of hiking will lead to a clearing and you should be able to see something similar to the first photo below. Looking up at the ledges from the first flat spot. Looking back at the approach before going up the ledges. Once you reach the large flattish clearing you will be need to go up and over a set of ledges on the left side. There should be a faint trail and possibly the occasional cairn. This set of ledges will lead you to another large flat area that should have a small lake (size depends on season). From here there seemed to be two options to gain the steep slope that leads to the summit plateau. On the way in we stayed north (the right side looking uphill) of the second and bigger lake and followed the red path in the photo below. This had us going along the ridge which was fine. On the way back we went on the other side of the big lake seen in blue below. Both paths met up in the meadow near the smaller lake and went over the 3rd class ledges in a photo seen above. Our approach followed the ridge seen below to some steep switchbacks which ended at an obvious notch. While the switchback section was a bit steep there was a trail most of the way and you could tell this section had seen a bunch of traffic. It is pretty hard to get lost if you aim for the notch in the photo below. The very pretty ridge line with a steep drop on the right. Below is another view of the ridge approach from the steep switchbacks. After gaining the notch at the top of the steep switchbacks you will be at a large plateau below the summit. This was the first time we could see the summit of Mount Conness from the approach. We had only previously seen the lower section of the North Ridge. Cross the sandy plateau and you should see a large cemented cairn and a few wind breaks with more cement and some USGS circular markers. This is where we left our packs and racked up for the climb. Almost to the notch after a bunch of sandy switchbacks. From this point continue down to either the second or third gully (I don’t remember which). As noted in the Supertopo don’t go down too early since the first gullies cliff out. Also you should be able to see the SW face in full view from the top of the gully. There is a trail, that should not be followed, that keeps going down past the correct gully so if you go more than 5-10 mins from the edge of the sandy plateau you have gone too far. A few 3rd class sections lead to scree surfing and talus walking towards the Southwest face. The photo below was taken from the approach. As described in the Supertopo the route starts just right of a section of black rock which is often wet. As the summer heat reached near record highs two weekends ago I found myself shivering in the cold shade of the Northeast Face of Langley Peak. This summer I have taken a bit more time to explore the Eastern Sierra and this weekend was one of the most adventurous yet. The goal was to establish a new route on the massive Northeast face of Mount Langley. Currently there is only one other technical route to the summit of this 14,054 foot peak. Langley would be my first 14er so I was super excited to try to climb it via a new route. Shay had a handful of maps and semi-useful descriptions that would guide us to our first bivy. The start of the approach was a familiar jaunt up to the Stone House. This trail was nice and Lizzy and I had been there about a month earlier. We were apprehensive about water so we both packed maximum capacity, carrying almost 2 gallons each. The stone house complete with new prayer flags to honor the passing of Bruce Binder. Reaching the stone house we could tell that Tuttle Creek was still flowing strong so we dumped a bunch of water and set out to the unknown. Shay and I had been to the Lone Pine Peak side of the Tuttle Creek drainage but never up towards Mt Langley. A bit of guess work lead us up to a trail behind the metal shack above the stone house. We took this across a big slope and eventually ran into a bigger trail. This well cairn-ed trail continued up hill for many miles and brought us to the Keyhole wall. Really happy that we were able to follow a trail all the way from the stone house to the Keyhole Wall. Following the advice from previous ascensionists of Mt Langley, we crossed the stream and headed up the talus making sure that our water source was still flowing. Eventually the sound of the gurgling stream died out and we bivyed 10 minutes or so above where the creek went underground. On our descent we realized that we could have camped over an hour further but likely at the cost of a good nights sleep. The stream had gone underground for a half mile or so and appeared in full force higher up the drainage. Shay looks sharp as we trek on past the Keyhole wall. Leaving from Pasadena by 10:30 am we made great time to Lone Pine and up the trail to our bivy. There was still daylight but it seemed prudent not to go too far above 10,000 feet. Fresh stream water was easily retrieved unfiltered due to our remote location. A dinner of packet food was sufficient and we opted for an early bed time due to our impending pre-dawn start. Looking back down canyon from our bivy. The ridge in the following photo was visible from camp and our information led us to believe the north face was just around the corner. Hiking up endless talus warmed me up but as soon as dawn broke the wind started and chilled me to the bone. I had to layer up, very unusual for me while hiking, and we made our way up trying our best to guess the right way. We second guessed our decisions and likely lost a bit of time traversing a steep slope instead of staying low in the main gully. Beyond finding the NE face we needed to spot a doable climb and get to it as fast as possible. There was only so much day light and this 2000 foot face would require a lot of pitches. Around the right of the prominent ridge we spotted what looked like a 500 foot long crack system that would give us access to a higher ridge line. At the time I assumed all of the towers connected to the top and when this route looked too chossy we too easily decided to climb another line. The wind was killer and I was happy to have a jacket. We found an easy looking crack system that appeared less choss-tastic and I started up the pretty green and yellow granite. Leading in my jacket with a pack was a bit tricky at first but once I got a few pieces in the climbing started to be fun. I had to be careful of small foot holds since they often were barely attached but I slowly made my way up to the ledge below a wide crack seen in the upper right of the photo below. The start of the tower we chose to climb. Shay had the next pitch and decided not to go up the wide crack. We only had a single #3 and the largest BD hex. His lead followed a chossy pair of seams which took the occasional gear and then traversed right to the crack above the offwidth. This was low end 5.10 but very scary and insecure especially with cold fingers on even colder rock. The next pitch was mine and featured the hardest climbing of the route. I was faced with splitter finger crack providing the only passage to the top of the next tower. Heading up the fun first pitch in chilly weather. I did a bit of cleaning to get out the lichen and loose rock, down climbing to the ledge each time, before committing to the finger splitter. The locks were excellent and the feet exciting (i.e. a bit loose) as I slowly made my way up. It was over before I knew it and I was hugging a leaning pillar making my way past many loose blocks to the next ledge. 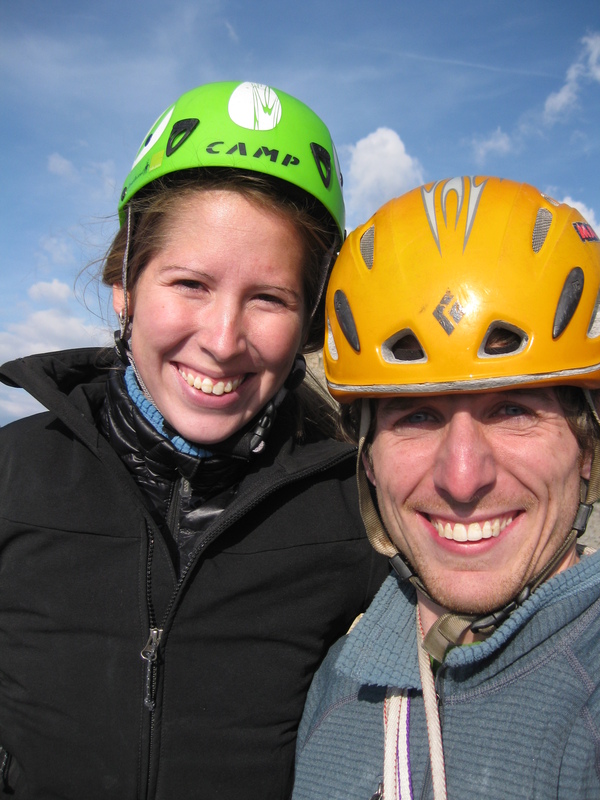 I saw a scary looking next pitch and happily belayed to give Shay the next lead. Shay gets bonus points for the next lead with crazy exposure on both sides of the ridge. He climbed about a 60 meter pitch requiring a bit of simul-climbing on our short 48 meter rope. I took the next pitch and downclimbed into a chimney, which was semi bottomless with 300 feet of air on my left. Squeezing behind a leaning flake our Nuts somehow detached from my harness and fell into the void. I continued with some easy downclimbing into the gully below. Shay on top of our tower before downclimbing into the gully. From this position we could see choss and snow going up towards the summit. Our tower had not connected to a main ridge line and the rock above didn’t look to inviting. We decided that it would be best to descend since the gully we were in seemed reasonable. In retrospect we could have climbed back up on to the ridge line but it would have been at least another 15 pitches to reach the summit. We had gotten a bit of a late start (climbing wise) and it was already noon so we took the safe option, not wanting to get benighted. Luke descends back to the base. With 5 new pitches established it wasn’t a waste of a day and we took our time back to camp. We found the upper part of the stream and hiked down past pretty waterfalls and surprisingly lush vegetation for the area. After some more rest at camp we packed up and relocated to the Keyhole wall. Our next bivy site was not as spacious and level but was a bit closer to the stream and had a beautiful boulder with sculpted holds that I happily climbed. The NE face of Langley showing our route, Unstoppable Tower Tango, on a disconnected ridge. We hoped to do a bit more new route action on Sunday and choose the obvious splitter on the left side of Keyhole wall. We knew it had most likely been climbed but hoped to find otherwise. Shay lead the first pitch following good rock to a nice belay. There were just enough loose blocks and lichen to make us think we were in FA mode. We swapped leads and I headed up towards the roof, the feature that drew me to this climb. After trundling a few blocks I got into a very nice hand crack and motored up to the roof, running it out a little to save my single #3. At the bottom of the roof I was able to place a small cam and then wiggle the #3 deep into the fissure. A #4 would have fit perfectly on the outside (which had better rock) but we didn’t have one. Some how there were some jugs on the right side of the crack and I was able to pull over without OW technique. I heel hooked and then mantled the ledge to get established, taking time to bump along my #3. I had cleaned sand out of the holds and fully believed I was the first one up this crack!! To my great disappointment after the next few moves I saw a pair of bolts. This made things much easier for belaying but ended the possibility of an FA. Psyched to pull over the #4 camalot roof. 5.8+ ?? Shay lead the next pitch, a long fun splitter, to another bolted belay where we considered rappelling. I did not want to lose any gear, since we didn’t have the required 2nd rope, and opted to keep going into unknown territory. 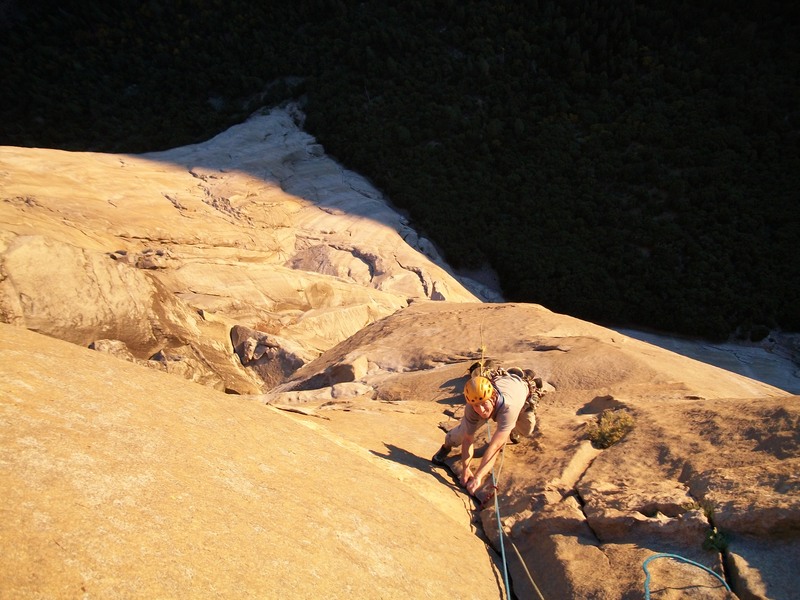 I incorrectly choose to go left and had a sketchy loose lead on really bad popcorn granite. I had to excavate placements and wasn’t sure anything would hold. This lead and the next were most likely new pitches but forgettable. Fortunately they allowed us to reach a nice shady belay below the upper head wall. It was my lead again and I was in for some adventure. The next pitch was the the best on our finish variation and the rock quality was awesome. I followed a nice splitter for 20+ meters before it pinched off and I traversed right onto a knobby face. A bit of creative climbing put me into a wide crack and a few moves past trees had me starting to think about a belay. Climbing the excellent 6th pitch on the upper headwall. My gear was running out and I had to downclimb a little to back clean and re-place a piece. The cracks on the right side were pinching out and I didn’t know what to do. There were a handful of large bushes/trees about 20 feet above me and I knew that should be my belay. With a solid piece above me I stepped down and left to get my feet in a wide crack, crimping on nothing with my hands. I spotted a line of knobs for my feet and slowly traversed left, hoping they would hold my weight. Gaining a tree I made a few more easy moves and then was able to get in a good anchor. An amazing set of exciting traverses made this a standout pitch. Shay followed clean without the security of the last piece that had essentially given me a TR for the traverse. Another pitch, some simuling and a bit of soloing led us to the summit and a long grueling descent. After following the gully down we took a risk and choose the left fork. This went down a ways and we did some sketchy downclimbing (we could and should have rappelled using a tree) before another split. Faced with a 30 foot drop we rappelled this time, missing an easy looking downclimb that we saw once we were down. A bit more down climbing put us at another split which we went right. This was our last gully and put us back to the ground. The descent took us between two and three hours and put two very tired climbers back at the base. Amazing Indian Food filled us back with energy, courtesy of TastyBites, and we packed up and made a quick descent taking less than two hours to get back to the car. I was impressed with the rock quality on the Keyhole wall and would like to go back with a bit more equipment and check out some of the lines on the face. 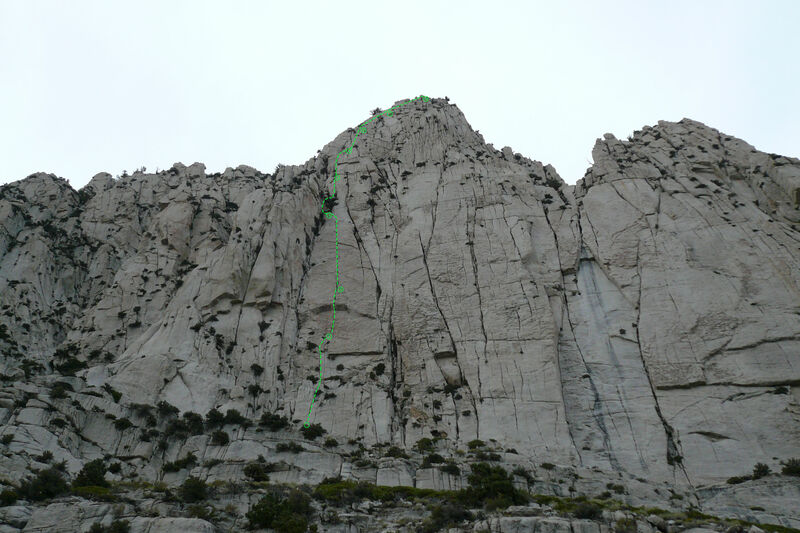 Even if most of the crack lines have been established there are still many routes to do! The last few weeks of July were particularly hot in SoCal and Lizzy and I have escaped to the higher altitudes for a bit of fresh air. Many weeks back, the day before Lizzy returned to Cali, I took a short trip up to Keller peek with Josh. It was pretty hot but we got a bit of bouldering in and did some exploring around Dinosaur rock. Josh had been waiting at the campsite while I battled traffic and informed me that the middle of the day was HOT. As the sun fell low in the sky I got excited to take advantage of the cool temps for a possible first ascent of a dirty finger crack on the side of lower dinosaur rock. We ran back to the car and got headlamps and gear and I proceeded to make my way up the crack covering Josh with dirt and granite in the process. The light faded but luckily I had borrowed Josh’s head lamp and made it to the top bleeding, covered in dirt, but happy. My headlamp, which I had given Josh, had almost run out of batteries and as I struggled on the climb Josh was slowly slipping into darkness. Once off belay I set up a rappel to clean the gear and Josh walked around the back to clean my rap anchor. I was psyched to have done a climb already as we quickly drove to town to get pizza. Josh had looked at a very pretty line on the back wall that followed a series of crescents past 4 bolts. I rapped down it to place the QD’s and Josh gave it a go from the ground. He managed to figure out the first section but got stuck at the crux between the 2nd and 3rd bolts. I struggled much more on the first section but found some hidden crimps and made it to the top. After a rest, where Josh tried a few other routes, and another try on TR I was able to redpoint this fun route just barely sticking the crux bump and keeping my weight low on the following sloper traverse. This was our last route and a great end to the day! Looking up from the base at the crazy knobs on Boney Fingers. Fresh off getting her wisdom teeth out, Lizzy wanted to take it easy, the Sunday she returned from Seattle, so she brought her bike to San Diego so we could go for a long ride. I had recently been convinced to start triathlon training by a friend and I was excited to do a bit of extra biking with Lizzy. 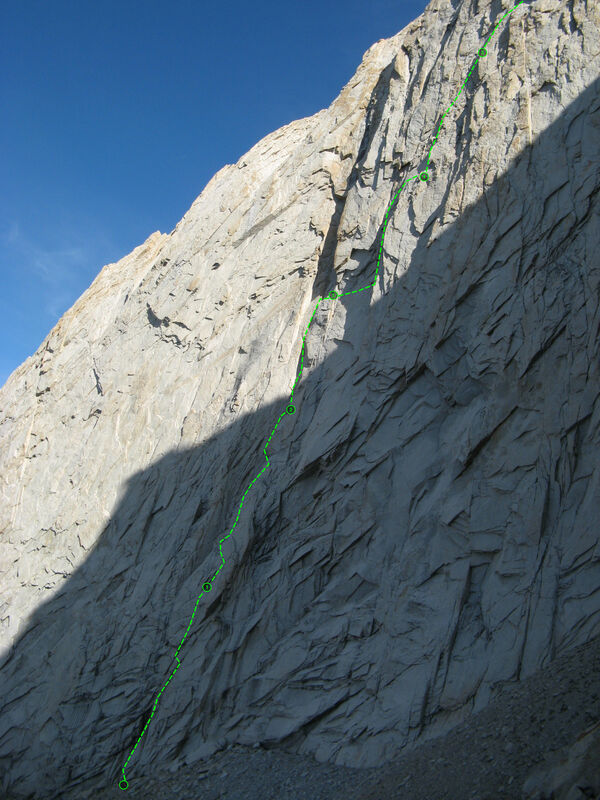 The following weekend we were to go to Whitney Portal to climb Boney Fingers, MSMR, and Ghost Rider. This was a lot of pitches but they all seemed doable. I had recently started campus training with my friend Stein and got in a workout before we got on the road Friday morning. This was a bad idea, since my body did not have any time to recover. I felt fine on the hike in to Boney Fingers, but my body shut down as soon as I started climbing. The 5.11 direct start was beyond me and I pulled on the bolts to get established in the crack. It seemed odd that there were only 3 bolts since there was serious ground fall potential before you get in your first piece. I managed to work my way up the crack, feeling way out of shape, but didn’t fall and made it to the knob anchor. Looking out from the stone House as described in our directions. The 2nd pitch was much more fun and was a staggering 70 meters!! I didn’t have nearly enough quickdraws and placed all but one of my cams. The last many feet were protected by small nuts and thankfully I didn’t feel too much rope drag with my Sterling Ion. I would suggest the following rack: 1 blue alien, 3 green aliens, 5 yellow aliens (or more! ), 3 grey aliens, 1 or 2 – .5 camalot, 2 – .75 camalot. Also bring many small nuts, at least 10 qds and a handful of slings. 70 meters is a long way! We followed the advice on MP.com and I rapped first, fetched the 2nd rope which Lizzy pulled up and then double rope rapped. We did this in time to get back before dark and got ready for an early-ish departure the next morning. I was very excited for SuperDike (aka MSMR) since I knew all the first ascentionists. After an exciting drive (narrow road with steep dropoff on one side) we made it to the “trail head” and made good time to the stone house on a very steep but decent trail. After leaving the stone house we followed a very good trail of cairns for a long way until they disappeared. We had notes from two friends but the approach photos had somehow not printed. Despite this we continued cross country up the hill hoping to rediscover the trail. About an hour and a few false cairns later we found the correct trail much further uphill than we had been. We had been hiking for over 2.5 hours at this point and were not quite sure of our destination. We feared that it was a far off wall (1st photo above) since we could not see a large dike on the face closest to us (photo directly above). 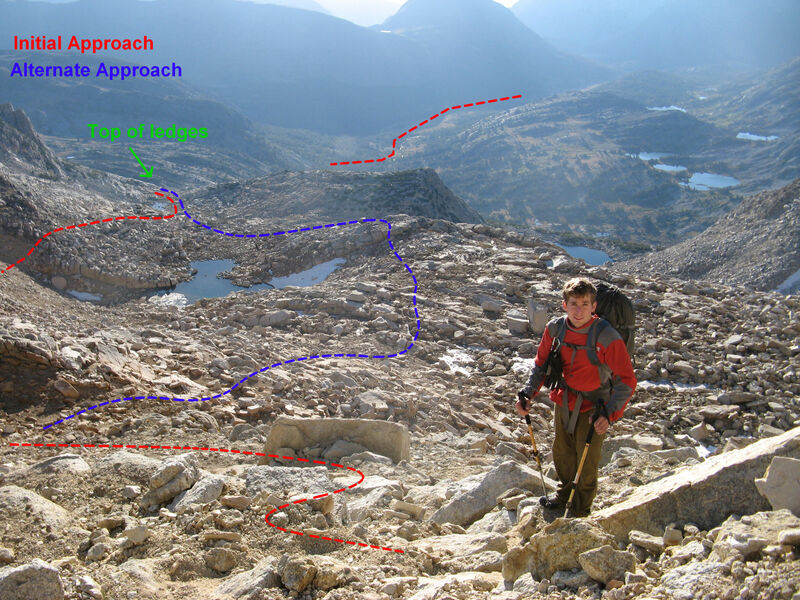 We had spotted something similar to the “sea of knobs” noted in the topo but could not at the time figure out how the route would lead to this feature. With much doubt we continued until a large talus field noted in the directions at which point we had reached the 3 hour mark. The day had been getting progressively hotter and we were still over an hour from our objective. The less obvious upper trail. The well traveled but incorrect lower trail with a misleading HUGE cairn. Lizzy and I made the hard decision to turn around, which was the right one, since we had lost so much time already and likely would run out of water and be hiking back in the dark. Determined not to lose our way we managed to take the high trail all the way back to the stone house. We found that we had made an initial error (going low on the good trail past the huge cairn) versus staying high on a worse trail. Hopefully these photos will help the next party choose the right trail. Once we hiked out and drove back to Whitney Portal (with a stop at McDonalds for a McFlurry!) we had many hours left in the day. With a single small pack of water and food Lizzy and I decided to go as far as we could up the Meysan Lake trail. It was so nice to know where we were going after being lost for over an hour approaching Lone Pine Peak. It was so chill to have such a small pack and we had a much better time chatting instead of the constant, “AH, we are lost where do we go” from before. The hike was pretty and while we did not make it to the lake we saw some pretty rocks on the way up. We had forgotten our watch and headlamps so we turned around early to make sure we were back before dark. A happy Lizzy and Luke, no longer lost! Motivation was a bit low after being lost for a while so we drove back early for some relaxation on Sunday. Overall it was a bunch of drivingnd not much climbing abut it was still very cool to see Whitney Portal. There is so much granite and it makes me want to go back to try and put up some new routes. Now that we figured out where MSMR is I will have to go back for another attempt! I thought I knew what alpine climbing was about. I thought that Dark Star would be a walk in the park surrounded by hours of hiking. Boy was I wrong!! The description for Dark Star includes around 17 pitches with a bunch of 4th class and only two pitches of 5.10. While the base of Temple Crag sits just above 11,000 feet I was confident that we could make good time by simuling much of the climb and soloing the easiest pitches. The goal was a sub 24 hour which was a pace our friends had done the year before. Rushing to Big Pine to get as much sleep as possible. After a five pm departure from San Diego we made fairly good time and were at the trail head in big pine by 10:30. We set our alarms for a mind blowing 2:15 am and went to sleep as fast as possible. After 3+ restless hours we awoke filled with psyche and were met with a practically full moon. Konstantin had been to Temple Crag before and lead the way as we hit the trail at 2:50am. The next 6 or so miles passed fairly easily as we gained a few thousand feet of elevation towards a set of three alpine lakes. We crossed the river on a crappy log bridge just below Third lake and hopped across the talus field towards the base of the very imposing Dark Star. It was getting light out and I was happy with our timing thus far. However I forgot to fill a water bottle at the stream crossing which stung us later on. After a bit more hiking and a scree approach we dropped our packs and went in search of the spring that usually runs all the way down to the base of Dark Star. With no sign of flowing water we mixed snow in with the water in our nalgenes and set off with two liters of slush and a half liter of Gatorade. Looking up at the first pitch I noticed the obvious difference in the granite from the weekend before. As I had read the rock was much more featured and was filled with bands of Quartz. I felt the crux of the entire route was about midway up the first pitch. Some tricky stemming and use of poor face holds gave way to a good fingerlock and then better foot holds. Following with the full pack was a bit tricky and was a harsh warmup. A successful onsight for Konstantin of the first two pitches! Konstantin lead the first two pitches and then I lead the next three. The third pitch was my favorite of the route with exciting step across to a hollow flaked followed by cool moves up to a lazer cut thin fingers crack in a left facing corner. The rock was perfect and the crack was just thin enough to make it exciting. The end of my three pitch block put us at a chockstone belay inside the “intimidating” chimney. Second (closer) and first lakes. Such pretty water! It seemed that the best thing to do was tunnel through the chimney and Konstantin made his way up and after no gear for the first 15 feet he placed a cam and stepped out around the corner into the light. He made it a long pitch and ended on a very comfy belay in the sun. After exiting the cold chimney it seemed we may have been a bit off route but we continued on very easy ground up the ridge. After reaching the belay and snapping a few photos Konstantin set off again and we simuled a long block to the top of the first tower over fairly easy ground. Sun is shining life is good! Konstantin searches for pro as he exits the chimney. After a downclimbing and making an exposed traverse we were at a set of ledges below the next tower. We couldn’t quite figure out what the topo mean for the first pitch on the upper tower and nothing seemed obvious. There was a bit of a trail further across a ledge so Konstantin and I moved the belay and set off into the unknown. Konstantin followed some chalk up the next loose pitch doing an excellent job by not dropping any rocks on my head. It was a long lead and I was happy to rest since I had not had enough sleep the night before. I lead another loose pitch to reach the ridge which hopefully got us back on route. The altitude had not been too bad thus far as we approached 12,000 feet and I had been able to eat enough food only feeling like I wanted to vomit once. Back on the ridge we simulated until the ropedrag became really bad. In retrospect we should have either been soloing or have tied back in at the halfway point to simul on 30 meters of rope. I lead another block of simuling along the ridge that ended in a rap anchor. We tried to line up this with the topo and guessed we were near “pitch” 14 meaning we would be rappelling again shortly, however the next bit of climbing convinced us otherwise. The weather for the day had been amazing so far and I could see my arms burning in the sun since I had been expecting to be wearing more than my T-Shirt. I tried best to keep my Buff up over my neck and ears to keep off the sun. There was practically no wind and few clouds and we had only seen one other party at Temple. Celebrating the perfect day and the six amazing pitches so far! I was getting worn down by my belief that we were lost and it was eating into my psyche. The climbing was not hard but it was just challenging to have no idea where to go. I suppose my lack of alpine experience made it seem that the obvious route (the easiest line) was not the right way. I am far more comfortable when there is only one “possible” line. After rappelling Konstantin started off around the next tower on the right side on a set of 3rd class ledges. The climbing became 4th class and we simuled a little until having to stop again due to bad rope drag. This belay was on top of a very pretty tower and a jagged line of spires were between us and a large red tower shown in the topo. Riding the spire! How could it be so warm above 11,000 feet?!? Konstantin lead off again on easy terrain only to find a rap station about 150 feet later. I thought this meant we were back on track and told him to stop. After find the belay and the kind of odd rap station I was not so sure so I kept going and downclimbed about 50 feet (5th class for sure) and did a bit of traversing to reach a better looking rap station. The Big Red Tower from the topo can be seen in the back left of this photo. This rap put is in a gully that I believe is described in the Croft topo. We opted for the easy and obvious 3rd class way on the left side of the next tower. This took us past a bit of snow which we happily ate to stay hydrated. 16 pitches completed the next belay put us back on track with a very obvious rightward ledge traverse following yellow lichen. This was at the base of the large red tower and concluded the technical section of the climb. I was mentally exhausted and wanted to be moving as fast as possible. I was worried about time it would take to climb the remaining 500 feet to the summit. Konstantin kept good spirits and helped me calm down and stay safe. Konstantin makes his way across a ridge of chossy spires. Turning the corner we saw a large section of ledgy terrain that I insisted we solo. I wanted to be moving faster and was confident that we would save time (speed = safety in alpine climbing) by moving at the same time. At above 12,00 feet there was no way I could move too quickly but putting away the rope sped us up and we were in the top in no time. The temps quickly shifted as we entered the shade and the wind picked up. We both happily donned our jackets for the first time since the chimney belay. 5 Hour Energy Summit Celebration! At the summit it was 6:30 pm and we had been on the go for over 15 hours. Konstantin had brought a couple of the 5-hour energy drinks which we happily finished hoping they would keep us energized all the way to the car. A few summit shots later we started working our way down the talus to the final rappel. With the summit in the bag I was feeling better since the way down was obvious. Konstantin, having found the way down in much worse conditions, led the way and in no time we were in Contact Pass hiking towards our packs. Good thing it only took us 4 hours to get back to the car!! I chose to take the faster, yet more exciting, way down the snow filed while Konstantin stuck to the talus. I got a bit wet but was down in time to find the spring (which was still running but just didn’t make it all the way down to the base of Dark Star), fill up our water bottles, and sort all of the gear I had. The mosquitoes were out in full force and despite putting my Buff over my head I got many bites on my scalp. Once Konstantin arrived it was 8:15 and we still had 7 miles to go! To Dark Star and its many loose pitches with breathtaking views. Racing against dusk we slid and ran down the gravely talus as fast as possible. By crossing near the second lake we could hopefully cut off some time on the decent and we would be able to get back to the car sooner. Reaching the old road and the two nice bridges we were back on the main trail and Konstantin surged with energy. I had been keeping up so far on the uneven ground but I was no match on the main trail. With headlamps illuminating the trail and my trekking poles swinging furiously we tried to make up as much time as possible. Almost running at times we made it back to the car by 10:30!! This gave us a sub 20 hour time (19:40) and we were psyched at our success. Despite our 12 hours on route (which seemed slow to me despite 17 pitches or ~2500 feet of “climbing”) we had done the approach and decent quite quickly. I had never hiked so fast and Konstantin made 7+ mile summit to car push in a speedy 4 hours. Luke celebrates his first time to 13,000 feet! Doing longer routes car to car is an interesting experience and so far I have felt fairly good the day of only to have the fatigue hit me later in the week. On Dark Star I felt the need to rush and was not so sure of where we were going beyond “up”. I think it would have been a bit more fun if I had relaxed but it was hard due to all of the loose rock. I usually enjoy long granite routes because of the crack climbing which was sadly absent on Dark Star. It was wild to find so many incut holds on granite but the gear placement was trickier and there were many sections where you just couldn’t fall. Committing to a C2C adventure adds a new twist to any long climb and makes one think about how best to utilize sunlight and good temperatures. As well going for 12+ hours changes the mental game as the mind struggles with decision making while exhausted. So far Dark Star took the longest of any climb I had done to date which is strange since it had the least amount of “technical” climbing. On Positive Vibrations our 12+ hour time was due mainly to slow leading on the harder pitches not the length of the climb. On the Red Dihedral our 16.5 hour C2C time was slow mainly due to the wind and cold. One thing I find similar between Positive Vibs and Dark Star was the confusion and slowness due to tricky routefinding. Dark Star was an important learning experience for me and makes me wonder about how far I am really interested in taking Alpine climbing. Possible I was spoiled by the splitter cracks on the Incredible Hulk and was expecting a longer version of the same thing on Dark Star. Regardless the climbing was beyond beautiful and it was a good challenge to climb at altitude.